The PUMA Management Software provides a powerful, secure, and easy-to-use file management system available for storage, retrieval and management of digital voice recordings for law enforcement. PUMA provides desktop voice file management capabilities from any PC in the department which provides officers, detectives and others better access to recordings as well as improved efficiency in accessing information. PUMA is designed to upload the officer’s digital voice files as quickly as possible with minimal involvement by the Officer. Audio files are easily transferred to the PUMA Management System and an Officer can add Custom demographics, such as Case Number or Incident Number, providing important information about the recording that can be used later when searching for these files. With departments having different access/security concerns, PUMA has designed flexible security levels and access rights that can be assigned to individual users or groups. PUMA also includes technical security measures to prevent unauthorized access to data such as, file and password encryption (256 bit), secure data transfer using FTP protocol and file and directory protection. A Complete File Management Solution for Law Enforcement. As digital recorders become a valuable tool for Police Officers, departments are now looking for a better way to manage the voice recordings. 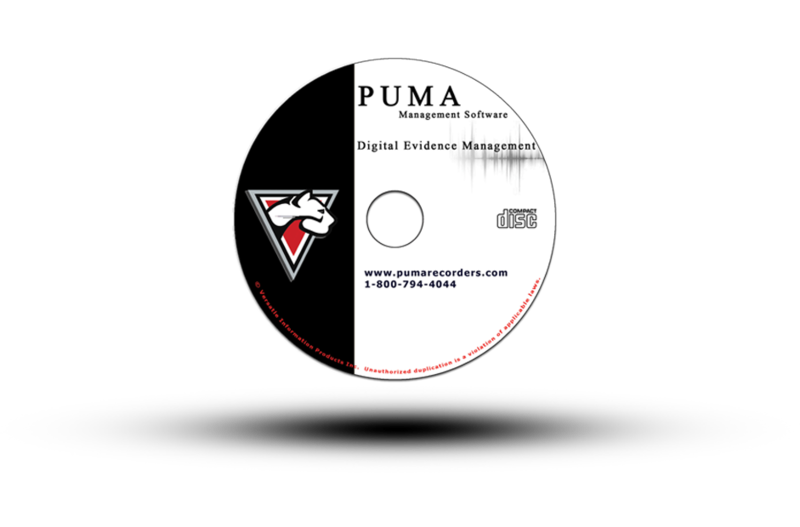 PUMA Management Software is the most complete file management system available for storage, retrieval and management of digital audio recordings for law enforcement. PUMA Audio Manager is a powerful, secure, and easy to use digital audio management software designed for Law Enforcement agencies. 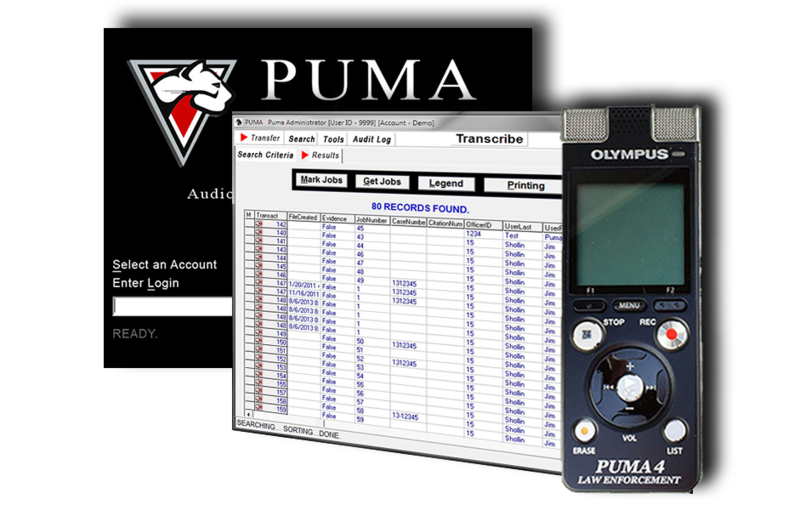 Key to the success of PUMA is its ability to provide officers an easy platform to download their digital voice recordings, add file information such as case number or incident number if needed and store the audio recording securely. With various search options, a recording can be easily retrieved for playback or copied to a CD. You need to get all the interviews relating to a particular case. You log onto the PUMA File Management System and search by case number and all recording, interviews, or field recordings, regardless of who recorded them are there for you to review or burn them to a CD/DVD for further distribution and storage. PUMA provides desktop voice file management capabilities from any PC in the department which provides officers, detectives and others better access to recordings as well as improved efficiency in accessing information. When handling a complaint you can log into the PUMA Management System at your PC, enter the officer’s ID and the date referred to in the complaint and soon you will be listening to the civilian contact at your desk. You save time and money and your officer stays out of court. Another productivity enhancing feature of the system is PUMA Transcribe, which supplies your record department with an integrated solution for transcription. PUMA's Enterprise Edition is our full comprehensive file management system designed for law enforcement agencies with no limits to the number of users that can access the system. PUMA Enterprise Edition delivers an integrated network based solution for your entire department where audio recordings are managed by a central file system providing easy access and retrieval. 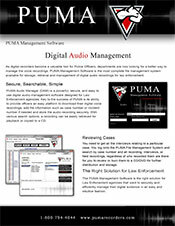 Discover the power of PUMA today and find out why it is the #1 law enforcement Digital recordings management software. PUMA Lite is perfect for small departments and divisions that need the power of PUMA's complete file management system for storage, retrieval and management of Digital voice recordings. PUMA Lite is by no means short on features. 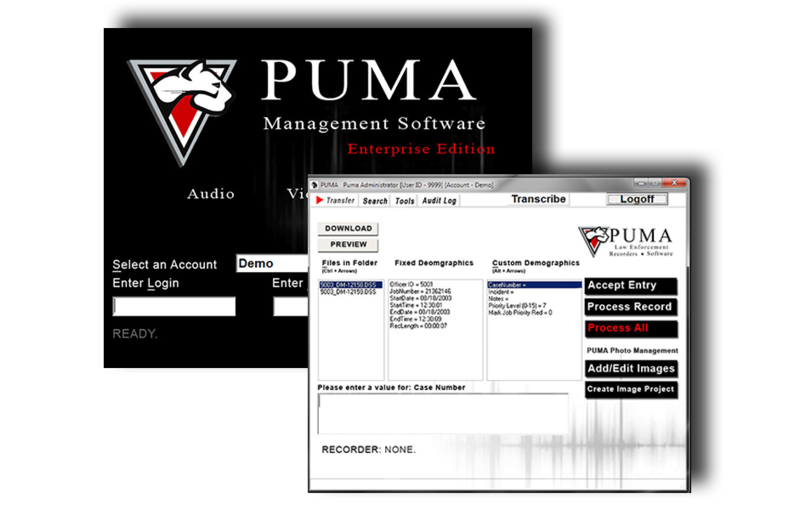 It offers the full PUMA Management platform modified for a few users at a lower price. PUMA Lite gives you the same simple user interface to quickly download recordings, add file information if needed and store the audio recording securely on a network. With various search options a recording can be quickly retrieved for playback or copy to CD. From any PC in the department, PUMA Lite provides officers, detectives and others access to recordings faster and easier than ever before. Discover the power and simplicity of PUMA Lite today! Departments or units choosing PUMA Lite can easily upgrade to the PUMA Enterprise platform if or when they are ready.